Daniel Ricciardo clocked the fastest time in the German GP opening practice. 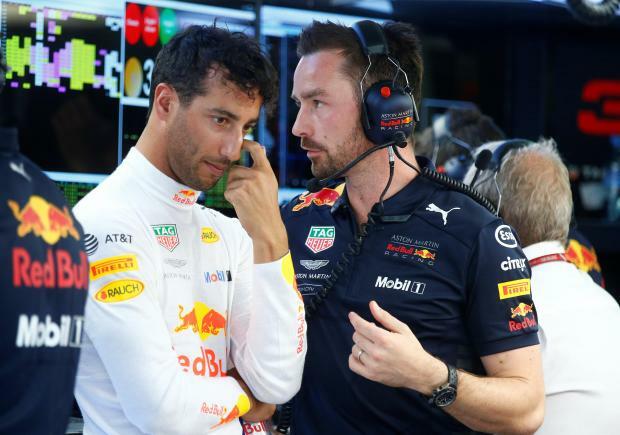 Australian Daniel Ricciardo kept Formula One world champion Lewis Hamilton off the top of the German Grand Prix practice timesheets by four thousandths of a second on Friday. The early pace on a hot morning at Hockenheim will have provided some consolation to the Red Bull driver, who faces a battle through the field in Sunday's race due to multiple engine penalties. Ricciardo's best lap of one minute 13.525 seconds compared to Hamilton's 1:13.529 for Mercedes. Red Bull's Max Verstappen was third fastest, in 1:13.714, with Ferrari's championship leader Sebastian Vettel fourth in 1:13.796, but on a slower tyre than those above him, in a session without any major incidents. Finland's Valtteri Bottas, his new Mercedes contract announced an hour before the session started, produced the fifth best time ahead of Ferrari's Kimi Raikkonen. Renault's Nico Hulkenberg, the only German driver apart from Vettel on the starting grid, tracked wide across the grass but managed to stay clear of the barriers in one of the few moments of note. Italian test driver Antonio Giovinazzi replaced Sweden's Marcus Ericsson at Sauber for the session, with the car shedding its engine cover on track after leaving the pitlane. Vettel leads Hamilton by eight points ahead of a home race at a circuit not far from his birthplace and where he first fell in love with Formula One as a child in the glory days of Michael Schumacher.